Belizeans have a diet quite unlike ours. We are used to having the world’s cuisine at our fingertips, but Belizeans have about 7-10 dishes that they eat over and over: rice and beans, stew beans and rice (two different dishes, believe it or not), Belizean stew chicken, potato salad, cole slaw, vegetable salad (what they call a tossed salad), whole fried fish, scrambled eggs, fry jacks, Jonny Cakes, cassava bread, fried plantain, and coconut rice are their mainstays. They will eat some version of these dishes for breakfast, lunch and dinner. 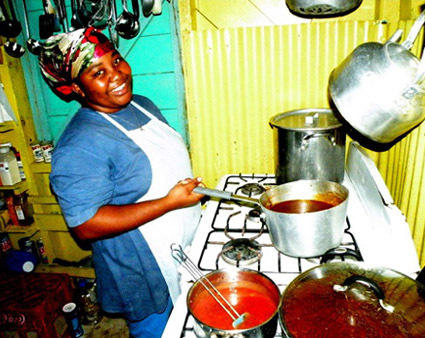 One could describe their diet this way: Comfort Food 24/7 and Belizean stew chicken tops the list. One time a friend of mine from Dangriga came up to visit me in the big city of Belize. We planned to go out for lunch. I asked him: “Where do you want to go for lunch? My favorite is the Lebanese, want to go there?” He looked at me with scorn and replied in a heated tone: “I am not Lebanese, I am Belizean! I eat rice and beans!” So we went to the regular Belize restaurant that served all the same dishes he ate everyday. Wash the chicken with lime juice. Skin it and put it in a big bowl. Mix enough recado with a little water just to color and add to bowl. Slice onion, chop pepper, mince cilantro, and garlic and add that and everything else to bowl. Mix well. Let sit for at least an hour. Remove chicken from bowl. Saute’ chicken in frying pan until almost done. Add onions, garlic and pepper from bowl on top of the chicken and let it finish cooking.